When Japan formally surrendered in 1945, several mobile units of the AFRS were reportedly already on Kyushu. These were the same mobile units that had previously broadcast throughout the island hopping campaign from as far south as the Solomon Islands and New Guinea, had then served in the Philippines, and were now on mainland Japan. Within a day or two of the surrender, Radio Tokyo's undamaged studios were broadcasting WVTR programs over the former JOAK transmitter, and other WVT callsigns could be heard around Japan over the next few weeks as AFRS stations took over major NHK studio and transmitter facilities. Callsigns were largely regularized to the WLK series by 1946, the same year in which the 'Far Eastern Network' ID was first heard. By 1950, WVTR and the other individual station callsigns were gone, replaced by Far East Network, or FEN. In the 1950's, FEN stations came, went, and sometimes came again, as US forces contracted, expanded during the Korean War, then contracted again. FEN Itazuke Listener Confirmation Card. We've carefully researched AFRS stations in Japan from various sources, including FEN materials, but we're still not completely certain we've got them all in our listing! If you or your relatives have ever been involved with any of them, or you have memorabilia, photos, images, recordings or any other items relating to them, please contact us and help us tell the stories of these long forgotten stations that graced the airwaves some 50 - 60 years ago. AFRS stations soon became popular with Japanese civilians as well, and FEN continues to broadcast today from various locations as AFN. 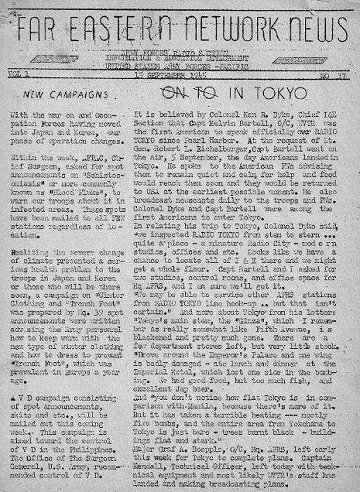 According to the September 15 1945 issue of the 'Far Eastern Network News', 'Captain Melville Bartell, O/C, WVTR was the first American to speak officially over Radio Tokyo since Pearl Harbor'. We're grateful to Stephen for sharing this special information with us, and with much gratitude to him and in memory of Captain Melville Bartell, we will feature more original WVTR Tokyo broadcasting heritage as part of our AFRS Armed Forces Radio Memories Collection. Let me tell you how I got to Radio Tokyo. I'm really a very lucky guy... have been all my life. This is just one of many stories that attest to that. © Eugene Allen Collection, CPRV, Maryland.